A fern growing on the trunk of a Sabal palm in Florida. Sunlight passing through the fern's frond highlight the many spore-containing sori. Source: NBII image gallery. A fern is a nonflowering plant of the phylum Filicineae having creeping or erect rhizomes and large conspicuous leaves. ferns are characterized by their alternation of generations: the conspicuous sporophyte, which possesses leafy fronds, stems, rhizomes, and roots and reproduces by minute spores usually clustered on the leaves; and the inconspicuous gametophyte, which resembles moss and produces gametes (sperm and ova). Fronds unroll from curved "fiddle-heads" and may be divided into leaflets. Ferns were growing in the Devonian period, some 400 million years ago. 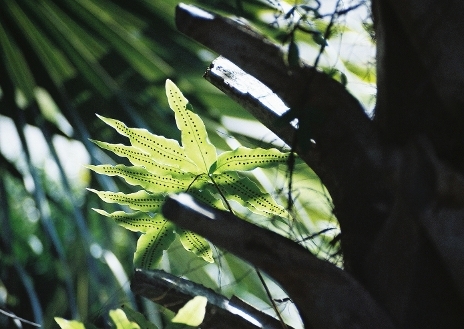 They are widely distributed throughout the world, but the majority grow in the tropics. About 10,000 species have been identified. The best-known genus Pteridium (bracken) grows on moorland and in open woodland.